ACX Monthly Earnings Reports Are Now Online! Have you seen what’s new? Your ACX monthly royalty and bounty payments reports are now available online! What’s that mean for you? Read on to get to the skinny on ACX’s newest feature. 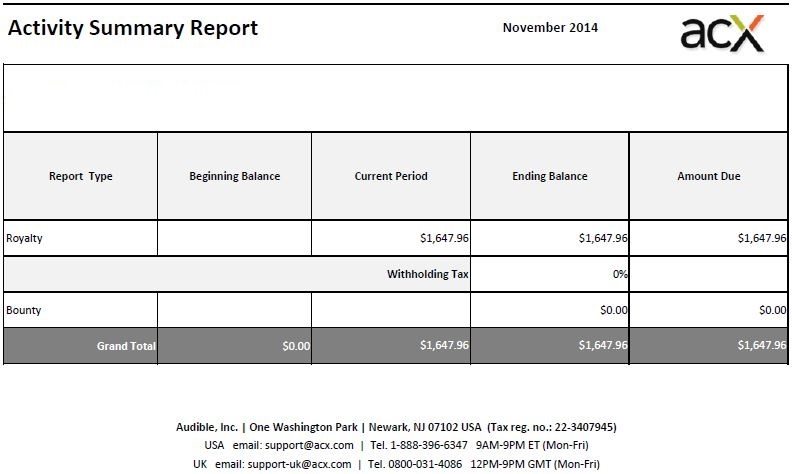 What’s New: ACX users now have the ability to view and download their Monthly Earnings Reports right from ACX.com. Reports for the upcoming month will usually be posted during the third full week of the month. How will you know when a new report is posted? We’ll email you with a head’s up! What’s Cool: New online Monthly Earnings Reports are a faster, easier, greener way to track your audiobook sales. Starting with November 2014 data, you can now search by date range. Download your reports as an Excel spreadsheet to sort the data to your heart’s content, or save as a PDF for easy offline access. On the next page you’ll see the new “Earnings Reports” tab. Here, you’ll find access to all of your available Monthly Earnings Reports. Want to narrow the reports down to a specific month or range of months? No problem! Simply set the dates in the “Select Period From” boxes and click “Submit” to view those months. Click on a month to reveal your reports, and click on the appropriate icon to download your preferred format. It’s that easy! Note that we’ll still send you paper reports for the next few months, but expect a transition to digital-only reports in 2015. With the combined power of the Sales Dashboard and Monthly Earnings Reports, tracking the impact of your promotional efforts have on your audiobook sales and bounties has never been easier! Are you an obsessive sales tracker? Tell us about it below! This entry was posted in Site Enhancments and tagged ACX, Audiobook Creation Exchange, audiobooks, make audiobooks, Montly Earnings Reports, site enhancement. Bookmark the permalink. Love this new feature (thank you!) but for some reasom now unable to view reports on mobile browsers. Have received the message “File not found” for each of the past 3 days using any browser. summary is all well and good. I don’t see where I can get sales broken down to the day level. is that not available?